A rocket carrying a French earth observation satellite and four other foreign satellites blasted off from the rocket port on Monday. Exactly at 9.52 a.m., the rocket - Polar Satellite Launch Vehicle-C23 ( PSLV-C23) - standing around 44.4 metres tall and weighing around 230 ton tore into the bright morning skies with orange flames fiercely burning at its tail. The rocket port is around 80 km from Chennai. The rocket's main luggage is the 714 kg French earth observation satellite SPOT-7. Prime Minister Narendra Modi, Andhra Pradesh Governor E.S.L. Narasimhan, Chief Minister N. Chandrababu Naidu, Union Minister Venkaiah Naidu, space scientists and other invitees at Indian Space Research Organisation's ( ISRO) rocket mission control room intently watched the rocket's upward flight with one way ticket. 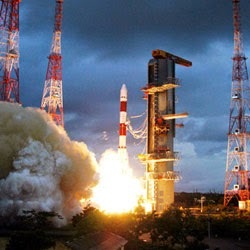 The five satellites are being launched under commercial arrangements that Antrix Corporation - ISRO's commercial arm - has entered into with the respective foreign agencies.